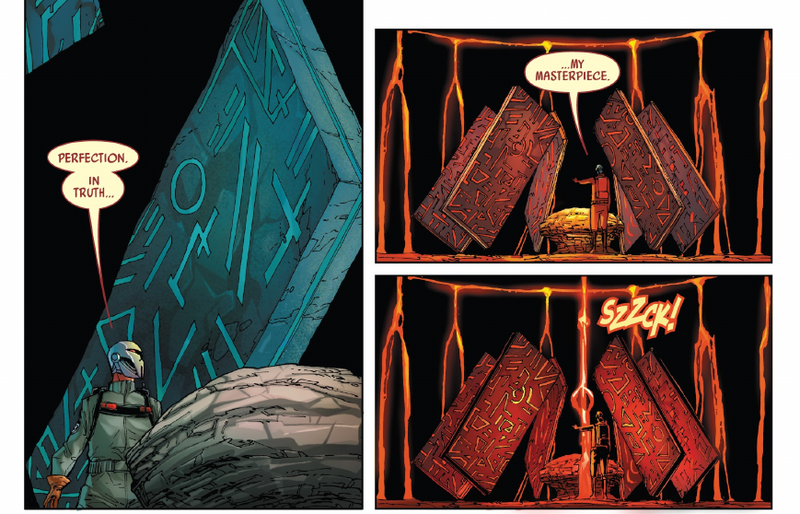 Darth Vader #23—by Charles Soule, Giuseppe Camuncoli, Daniele Orlandini, David Curiel, Dono Sánchez-Almara, and Joe Caramagna—is the latest in an arc that has sought to explore the origins of Darth Vader’s sinister castle at Mustafar. Star Wars’ incessant need to categorise and overexplain the minutiae of everything we’ve previously seen before can often be annoying, but Darth Vader is less interested in giving Vader’s castle a Wookieepedia entry update than it is with tackling something altogether more interesting: the legacy and history of the Sith that came long before Vader or Palpatine. 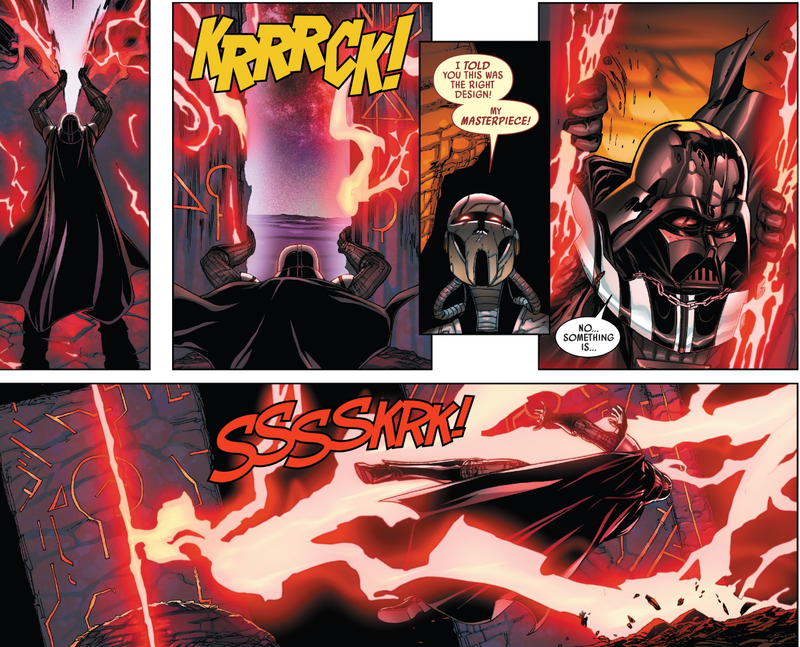 Part of the reason Vader elected Mustafar as the site of his not-so-humble abode in the first place (not just for it being the world on which he was “born”) is that it is a planet teeming in dark side energies, and over the course of the last few issues of the series, he’s been exploring and utilising those energies through another dark side artefact. It’s the mask of an ancient Sith Lord called Momin, an artist who, in a former life, channeled the dark side to create artworks of horrifying death and depravity. The final design—the one we see in Rogue One—seems to be the ticket for the duo, but not in the way Vader had planned. 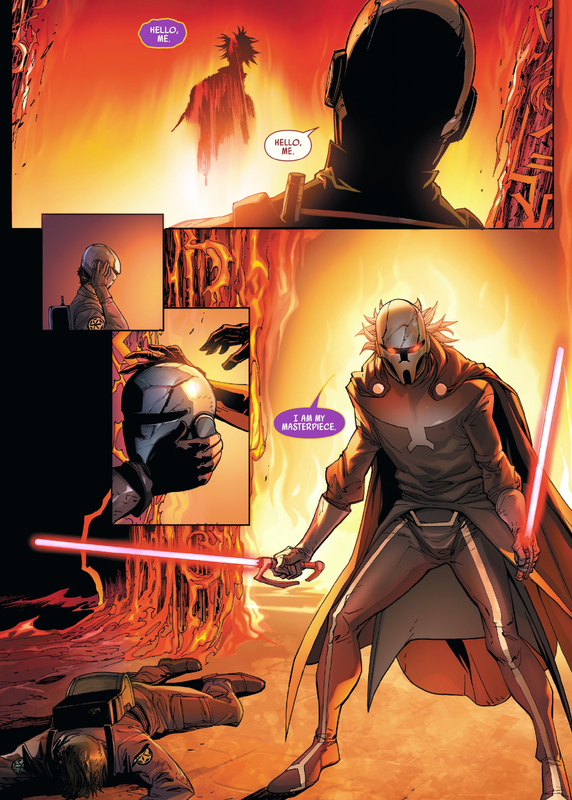 Called away to defend the site from increasingly encroaching Mustafarian clans, who are concerned that the Sith Lords’ channelling of the planet’s energies is destroying the lava world altogether, Vader doesn’t get to see the moment of seeming success for his plan. Using the distraction to his advantage, it’s Momin that opens the door between life and death. 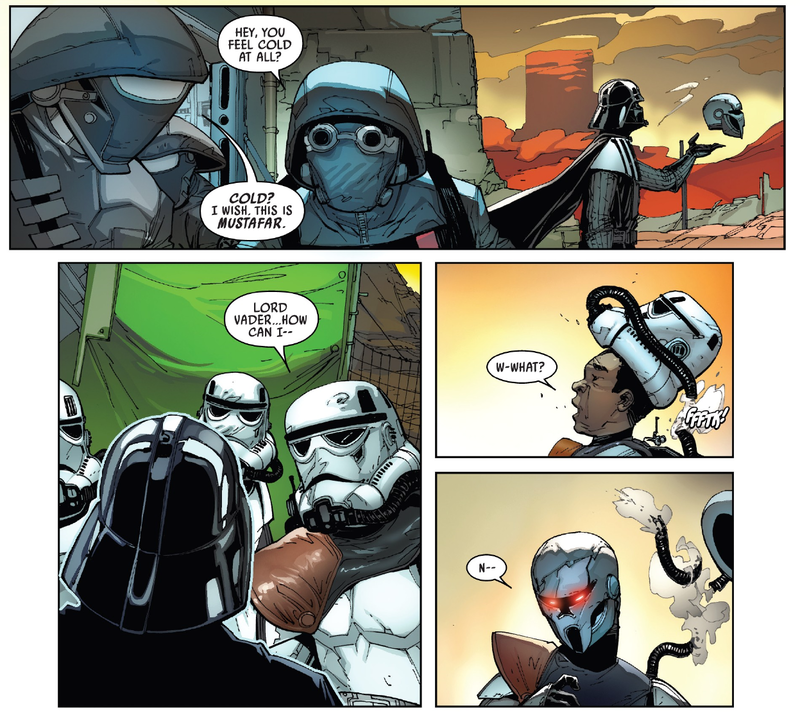 Because, of course, what could be more Sith than a moment of betrayal for personal gain?